Kidrobot, with stores in New York, San Francisco, Los Angeles, Miami and Dallas, and global distribution, is using a different approach to promote its designer toys. The small New York firm is using a digital idea that is big in Japan to get people engaged in a lighthearted way with the Kidrobot brand: QR codes. 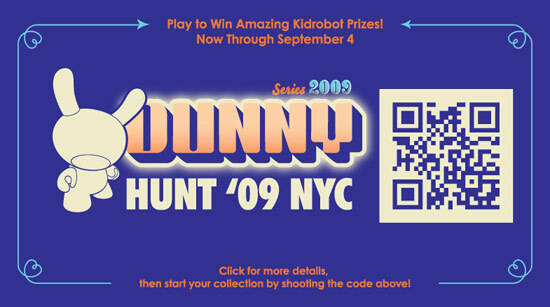 The codes are central to Kidrobot’s five-day scavenger hunt in New York City called “Dunny Hunt.” The effort, via New York-based We Are Plus and promoting Kidrobot’s 2009 Dunny Series of toys, requires participants to use their smartphones to scan QR codes on Kidrobot promotional items hidden around town. The company, whose products sell in over a thousand stores around the world, is using the New York program as a test, and plans to roll it out in the four other cities in which it has stores — and perhaps elsewhere. “This is version 1.0,” says Paul Budnitz, principal of Kidrobot. People who find the codes and scan them add one of a series of virtual Dunny toys to their digital “collection.” They also become eligible for prizes, including rewards for the first person to scan the QR Code from that day’s hidden item. The grand prize is a full set of the Dunny Series 2009 designer toys.